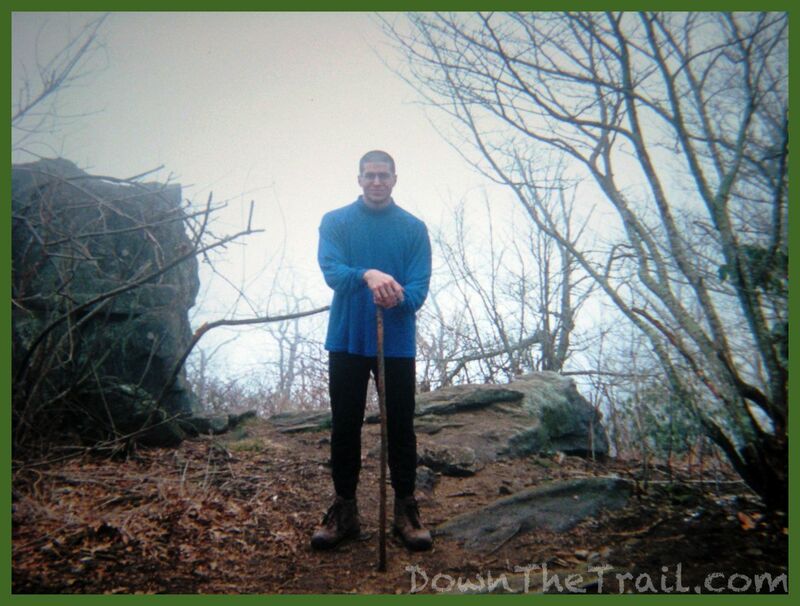 This is my original Appalachian Trail journal from 2001 (Edited for grammar). It includes additions that were written sixteen years later (in 2017). These are in italics. ROAD TRIP! What a perfect day for a road trip it was. Did I mention that I’m writing from Georgia?! My brother Steve and I left Allentown at 6:30 a.m. this morning. Have you ever seen, in the Indiana Jones movies, how they show a map and plot a dotted line on it to show where he’s traveling? Well, you can just draw a big old line from Pennsylvania to Georgia. We’re staying at a Days Inn tonight, fifteen miles from the trailhead. We got here at about nine p.m. The route we drove was amazingly close to the AT. It was such an exciting thing to see highway exits for all the trail towns: Port Clinton, Duncannon, Harper’s Ferry, Front Royal, Waynesborough, Pearisburg, Troutville, and now finally here. We were on I-81 for a long time. The weather was beautiful, the countryside was beautiful, the music was good… I couldn’t ask for more. Maybe things were going almost too well. I was driving through Virginia so my brother could rest a bit. I was checking out the livestock in the fields, catching glimpses of the Shenandoah Mountains, playing Springsteen’s “Born to Run” album, watching the miles go by… all of a sudden I come around a bend and there’s a … COP!!! Needless to say, this guy didn’t care. I got my ticket (It was a 65 zone) and we went on our merry way. My brother had been driving as fast as me the whole way, too. Just my dumb luck. The change in climate throughout the day was amazing. We went from cold and raining in Allentown to sunny and nearly seventy degrees here. Spring was more and more evident as we continued south, through the greener and budding trees. The Southern accent just kept getting thicker, too. We got dinner from a Kentucky Fried Chicken in Dahlogna, and I could barely decipher what the kid there at the counter was saying. I was afraid maybe he wanted to duel with his banjo! Ha. I’m just so terribly psyched about starting the trail tomorrow morning. When I finally saw the Georgia mountains on the horizon in the setting sun, well, I could hardly contain myself. It’s a good thing we had a long day today, or else I’d probably have a lot of trouble sleeping tonight. It was great for my brother to drive me all the way to Georgia and see me off. It was our second road trip together without “adults” along for the ride. The first was a trip to Pittsburgh for the holidays, back when I was still in school. His friend Adam was along for that one. What sticks with me most from both these trips is the music. On the first trip they played the Harry Chapin Greatest Stories live album for a long way. He also had the Tom Petty Greatest Hits CD. All I wanted to hear from that was “Running Down a Dream,” of course, but “Learning to Fly,” would also make me think of the Trail for years to come. I’m here!! It rained on me all day, including some early thunderstorms. It’s supposed to keep raining, too. That matters not! Rain, I fart in your general direction! Your mother was a hamster, and your father smelt of elderberries! It’s just great to be out here, 3,700 feet above sea level. The archway where the Approach Trail begins was simply awesome to behold. My pack weighed 37 pounds at the scales they have there, with four days of food and two liters of water. I’m really happy about that. I was afraid that my pack would be quite a bit heavier. The climb up Springer Mountain wasn’t as difficult as I thought it would be! It was composed mainly of long switchbacks, and there was plenty of flat walking in-between the hills to catch your breath. The path was often a river of mud from the downpours, but I was feeling fresh and had fun with it. The Amicalola waterfall was beautiful. It’s apparently the highest waterfall east of the Mississippi River. Now I’ve never been very religious, as far as going to church is concerned. But I said a little prayer for my journey once it was underway. It’s a good thing to do. I reached the summit of Springer Mountain after only a few hours of giddily plodding through the rain and mud. 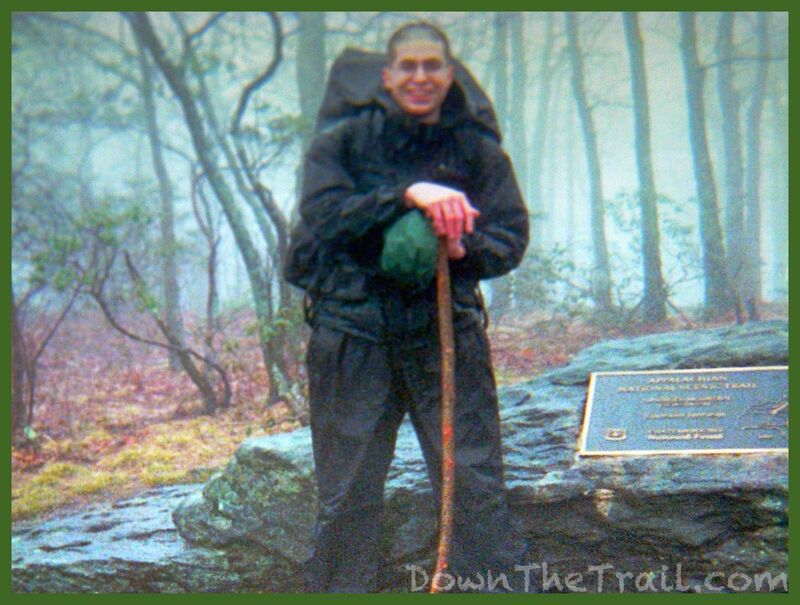 I took a few moments there, had the obligatory photo taken at the Appalachian Trail plaque, and continued on my way to this shelter. The view from Springer’s summit was non-existent because of the weather. It seems that I’m up in a foggy raincloud, doing the old Misty Mountain Hop. I forgot to pick up a rock from the summit area to carry to Katahdin. I’ll have to go back tomorrow to get one. I’ve already met a bunch of nice people, even though this shelter is quite empty… I guess because USFS Road #42 wasn’t passable today. Here at the shelter there’s a cool guy from Holland. He’s been hiking all over the world, including Nepal, China, Mongolia, Russia, and on and on. It’s his first time in America. He travelled here rather expediently today, and brought a hot dog from New York City to have for dinner! There’s also another friendly guy here from Denver, Colorado. His trail name is Green Sailor. He tried a thru-hike a few years ago but says he was too unprepared. I met him coming up the Approach Trail, and we got to talking a bit. Things do indeed seem to go much easier when there’s good company. There are two huge garbage bags hanging in the shelter, filled to the brim with all kinds of extra food that a boy scout troop just ditched here; Lipton Noodles, candy bars, and all kinds of good stuff. Nobody’s really taking it. We all have enough food and the “hunger” hasn’t set in at all yet. Two girls that are tented out nearby just came to the shelter to cook and hang their food. There’s only us three guys staying here inside the shelter tonight, on a rainy day in early April! So much for the so-called “crowds” at the beginning of the trail. I ought to socialize a bit now. I’m never going to remember people’s names. I woke on this bleak day in a dark motel room in Dahlonega, Georgia. My brother Steve still slept. I opened the window shades and stared blankly at the grey, overcast sky as a light rain fell. I remember being impatient as he went about the morning routine of showering, shaving, and so on. 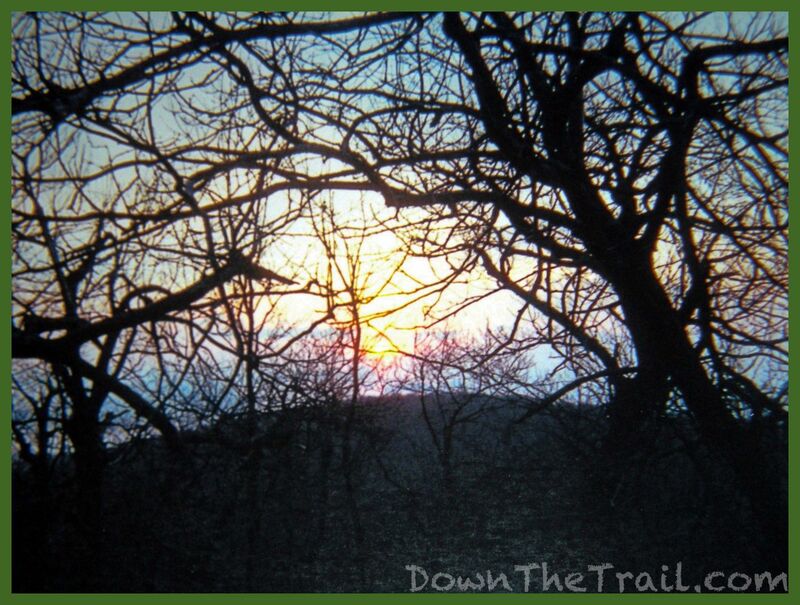 Day One on the Appalachian Trail had been anticipated for so long, and I was anxious to get going. I don’t remember what we had for breakfast. I think we skipped it. At 20 years old I didn’t appreciate a good breakfast nearly as much as I do now. 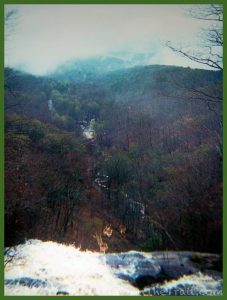 It was a relatively short drive to Amicalola Falls State Park, where the Approach Trail to the Appalachian Trail begins. The AT officially starts on the summit of Springer Mountain, in the middle of north Georgia’s mountainous forest wilderness. One must hike the extra miles up the mountain on this Approach Trail to get to the summit of Springer. Another, more popular option is to drive the unimproved US Forest Service Road #42 up through the woods to reach the official Appalachian Trail, but then it’s obligatory to walk southbound (backwards) for the initial few miles of the trail to reach the official plaque atop Springer Mountain. The plaque marks the southern terminus of the 2,200-mile trail to Mount Katahdin, Maine. I was extremely linear-minded on this trip and opted for the longer, straightforward Approach Trail. Steve parked outside the Visitor Center at Amicalola Falls and we walked into the small building together. The skies were still dark, rainy, and ominous. There was a lone man working behind the counter and I remember him as grey-haired, thin, terse, and indifferent. He had me sign in on a clipboard, giving my name, where I’m from (Pennsylvania), and the date (April 3, 2001). A ceremonious archway marked the beginning of the Approach Trail out the back door of the Visitor Center, made of stone and entirely impressive. To me it signified the beginning of a great journey for all those who enter. Here was a gateway that led all the way to a windswept mountaintop in Maine, over the hills and far away, down into the long green rabbit hole. It’s easy to imagine Gandalf standing on the near side of the archway, stating that if you pass through there, you will not be the same. I had my brother take a photo of me with my disposable Kodak camera, said goodbye, and took my first steps up the trail. Nerves and adrenaline rocketed me the eight miles up Springer Mountain. I was in a cloud all day and there were no views. On Springer Mountain I discovered that they had not, in fact, been broken in. They were too big (I was advised to start with slightly big shoes because my feet would swell after some time on the trail). My heels rubbed on the back of the shoes at the end of each and every step up the Approach Trail. Excited and naive, I blocked out the discomfort and told myself it wasn’t a problem. When I removed my socks and shoes this evening, I saw that both of my heels were missing their top layer of flesh. The affected area encompassed the size of about a silver-dollar, on each heel. Again, I was naive and didn’t realize that this could become a big problem. The next morning I slapped together a hasty solution. I carried moleskin for my feet, and chose to cover the sore spots with it. I put the fuzzy soft side down on my skin, and then held it in place with several turns of duct tape wrapped around my ankles. Done. I was the first one awake at the shelter this morning. I quietly ate my breakfast in the silent, half-lit shelter, looking out toward the trail. The sky actually looked promising. It was as good of a morning as you could ask for, and I got packed up and going rather early. Green Sailor and I headed back to the Springer summit. I picked up a stone to take to Mount Katahdin, and we both checked out the amazing view. Then we separately went on our ways. The trail between Springer and Hawk Mountain was absolutely gorgeous. The whole floor of the forest is golden from last autumn’s leaves. The way little drops of water from last night’s rain clung to the smallest twigs couldn’t help but be admired. Sections of pine forest left the trail laden with soft, dead needles. There was a small area of old-growth “cathedral hemlock,” trees that were too remote to be logged. They towered to the sky. That covers only the first half of the way to Hawk Mountain Shelter. Soon I found myself in a cloud of mist, through some of the most silent forest I’ve ever encountered. You could have heard a pin drop as I meandered through it. In several places there were small creeks with logs thrown across them, so you had to do a balancing act to get across the creek. How cool is that! Adventure! For most of the past two days, I’ve been finding myself smiling like a madman and even laughing out loud at how great this life is. The climbs up Sassafrass and Justus Mountains today left me royally whipped, reminding me how hard this trail can be. I’m glad the rain held off today. The damage report so far is that my heels rapidly lost some skin yesterday. They didn’t even have a chance to blister, and are nearly bloody. This shouldn’t be too much of an issue, as I slapped some moleskin on them and secured it with duct tape, and managed okay today. I may have to take an early zero day, which I wasn’t planning on. Spirits are high. There’s a number of other hikers in this cool area along the creek tonight, including Green Sailor and the guy from Holland. I’m too tired to socialize. That Sassafrass/Justus one-two punch did me in. Goodnight from my tent at Justus Creek. Before the trip I’d read somewhere that it’s a tradition to pick up a small stone from Springer Mountain and to carry it the entire length of the trail, placing it on the summit of Mount Katahdin at the end of the trail in Maine. I did this on my trip, and carried the stone with my most guarded belongings. My most guarded belongings were in a Ziploc bag. In it was a billfold that held my cash, ID, debit card, and minimal spare change. I no longer have the stone, but fifteen years later I can still see it and feel it in my mind. It was slightly bigger than the size of a twenty-five cent quarter, and it had shiny flakes on it, likely mica. In accepting my quest to thru-hike the Appalachian Trail, I bore this stone as my burden, fancied as my Ring of Power to be delivered to Mount Doom. The silence in the foggy pine forest on this day was whole and complete and intense. This was the most profound silence I’d experienced in all my life. Hawk Mountain Shelter was more crowded and active than what I’d experienced on Springer Mountain. I stopped there for a snack and barely spoke to anyone. Justus Creek was active with campers as well, but I found a spot for my tent and mostly kept to myself, passing out quickly from exhaustion. 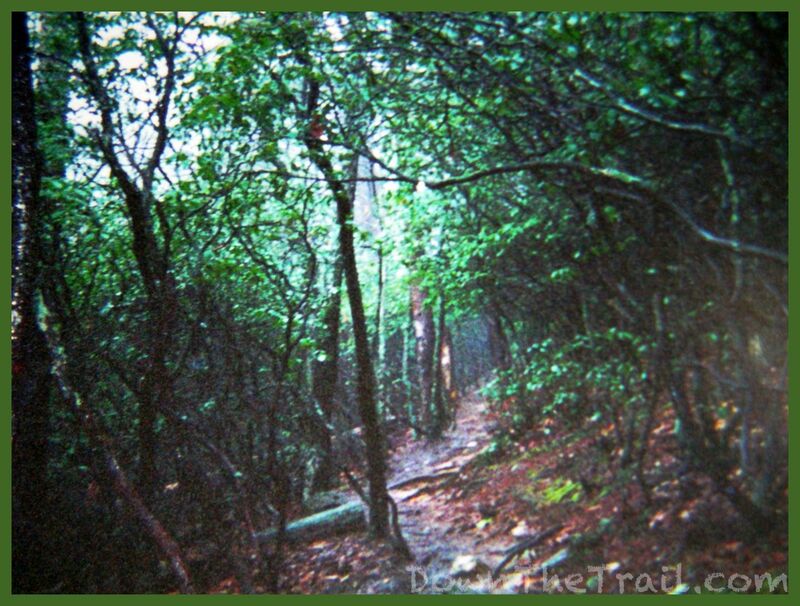 Shelters on the Appalachian Trail are most often designed as a simple lean-to with three walls, a flat wooden plank floor, and a roof. Most are intended to only provide a place to sleep under a solid roof without the hassle of setting up a tent or tarp. Shelters are particularly convenient during rainstorms, and are almost always located near a natural water source such as spring or stream. Most have a maintained outhouse nearby as well, most commonly called “privies” along the Appalachian Trail. Some have fancy composting systems, but most in 2001/2002 were a simple toilet seat over a hole in the ground with four walls and a roof. I used the term “zero-day” in this original journal entry. This is a common thru-hiker term that’s short for a zero-mile-day, a day where you don’t make any forward progress on the trail. Zero-days are most often experienced off the trail, in town. I’m sure that the mist cheated me from some spectacular views along the way, particularly from Big Cedar Mountain. You’re supposed to be able to see as far as Atlanta from there on a good day. The road crossing at Woody Gap was somewhat treacherous, because I couldn’t see the cars coming in either direction. The other hikers here tonight are joking about how they ran across the road. The shelter here is very nice. Too bad it was full by the time I came rolling in! There are four of us tented out here near the shelter, yet again including Green Sailor and the guy from Holland (His name is pronounced Rowloosh, who knows how the heck you spell it!). I need a trail name! I may just have to give myself one in another week or so. The privy here is interesting. It doesn’t have a door! That way, you have a fine view of the forest while you do your business. I’m beginning to understand why so many people leave the trail at Neel’s Gap. The hike today was incredibly strenuous. I’m already beginning to get the food cravings too. All of my gear is damp and muddy. My feet are really ugly. Both my knees are beginning to hurt. I think I’m just pushing myself too hard. I’m planning a nice easy day tomorrow over Blood Mountain, the highest point on the AT in Georgia, and into Goose Creek Cabins to dry out… and for some rest and relaxation. On the morning of this day I realized a lot more people were in the vicinity of Justus Creek than I thought. The trail seemed crowded for the first time. I leap-frogged with a man and his son for the better part of the morning. They were donned mostly in camouflage and wore external-frame packs. 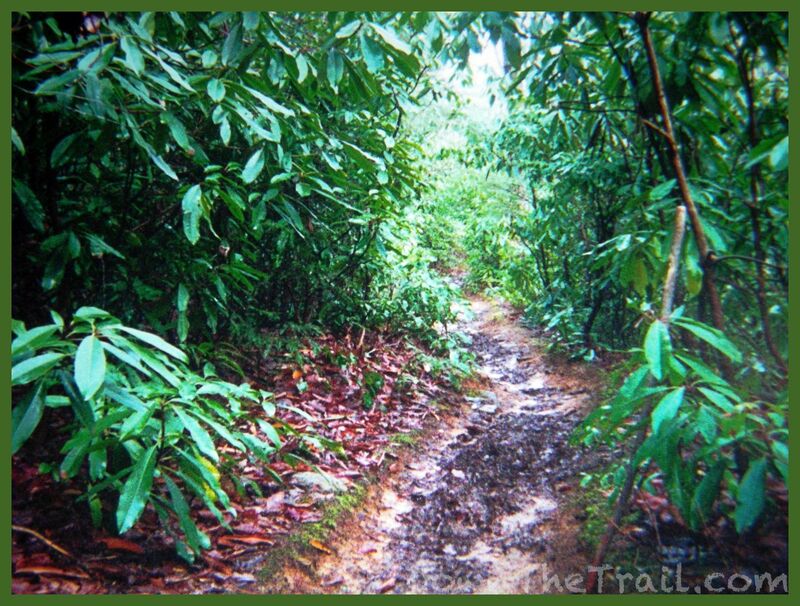 I remember the scent of this morning – it was that humid-wet-soil-and-wet-rotting-leaves-in-the-woods sort of smell… mixed with my body odor. 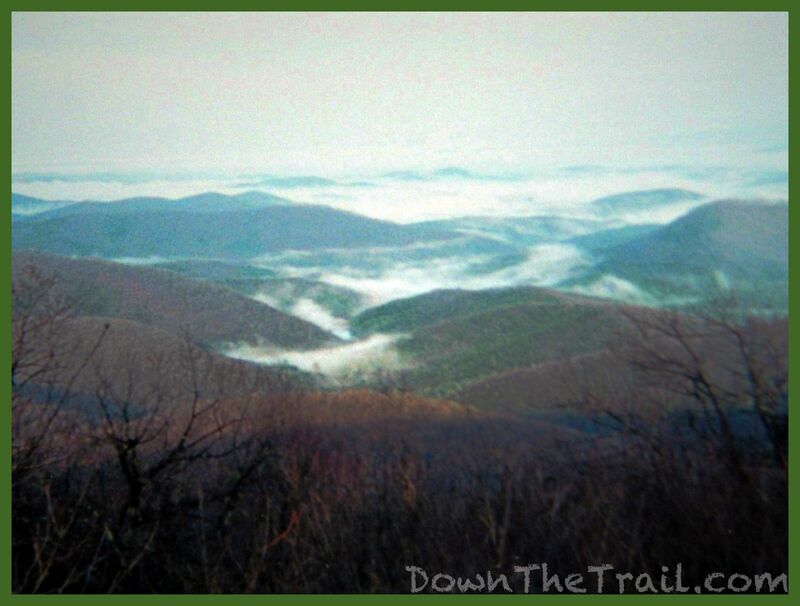 I remember coming up to the overlook at Big Cedar Mountain after a twist in the trail. Everything had been fogged in, and the air was silent and moody. I was in a cloud. There at the clearing was a lone day hiker, holding his cell phone to the sky in the white, featureless air. We engaged in brief conversation before I moved on. You may remember that cell phones were still quite bulky and more unreliable in 2001. 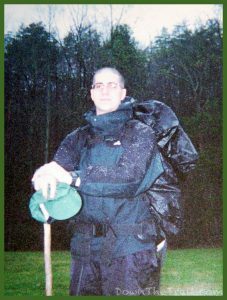 Very few thru-hikers carried them, and in fact their presence and place on the “wilderness” trails was controversial. If I had a mind to, I could have told this man that his use of a phone on the trail was wrongfully inconsiderate of myself and others… that even the sight of it offended my delicate sensibilities. A great majority of trail users would have sided with me on this trail issue of the time. Much has changed since then, of course. A friend of mine told me that in the Spring of 2016, when he hiked a section of the trail through Georgia, that he experienced hikers streaming Netflix movies in a shelter. At Woods Hole Shelter I was thoroughly whipped and feeling destitute in my cold, damp surroundings. The shelter was full of other hikers I hadn’t met. They seemed to have become fast friends already and talked loudly amongst themselves. I eavesdropped a bit from my tent camp, about fifty yards away. A warmth seemed to emanate from the shelter. I was already very hungry. Through a stroke of brilliance I’d chosen not to carry a backpacking stove, opting for cold dinners instead. Later other hikers would often comment on this trait of mine, and I justified it with statements like it was more lightweight, there was no hassle with cooking and cleanup, and less reliance on water at camp. All of that was true, but I think the reality was that I’d seen a lot of people struggle with priming and lighting their MSR Whisperlite stoves (the most popular setup at the time), and I didn’t have a clue of how to go about operating one for myself. Being a stubborn individual, I never acquired a backpacking stove throughout all of 2001. In the planning stages of the trip I pre-packed and mailed all of my food supplies to various waypoints along the first segment of the trail. I did this as far as ahead Fontana Dam, North Carolina. I figured beyond that point that I’d know what I was doing and could purchase the rest of my food in towns along the way. So for dinner every night on these first weeks of the trail I had cold cereal – a variety of Fruit Loops, Lucky Charms, Cheerios, and Cinnamon Toast Crunch… eaten dry, out of a Ziploc bag. There at the Woods Hole I had the special treat of a Reese’s Easter Egg for dessert before crawling into my damp tent. All the other hikers were out of Woods Hole earlier than me today. I spent some time hanging out there alone, because I knew I had a short day ahead of me. I think it was almost eleven o’clock in the morning by the time I got going. Everything was still foggy. Every step going up and down Blood Mountain was very slow-going for me. I didn’t feel good at all. The mountain is named after a supposed battle 400 years ago between the Creek and Cherokee Indians that made the hills run red with blood. I also passed by “Slaughter Gap” and “Slaughter Creek.” I imagined arrows and tomahawks flying at me, and suddenly my knees and feet didn’t feel so bad. The two girls from Virginia that I had been seeing since my first day were at the top of Blood Mountain, chatting with a very nice middle-aged couple. The couple was saying that their “college-aged” daughter was probably having a party. She always does when they go away. Sounds familiar! 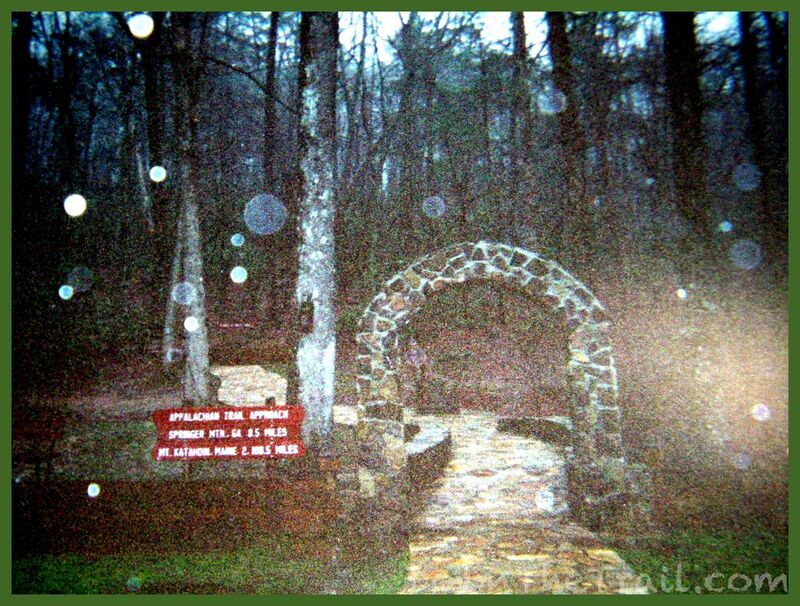 The Blood Mountain Shelter was made of stone and very cool looking – not that I’d want to stay there. The thick mist again obliterated another awesome view, from here at 4,500 feet above sea level. I saw tons of day and section hikers going southbound as I hobbled down to Neel’s Gap, remembering that today is a Friday. The descent seemed to take forever, but it was nice to gradually come out of the fog down to an elevation where Spring is more evident. Soon I began to hear the sound of traffic, and at long last I came upon a paved road and the Walase-Yi Center! Aaaaahhhhhh, YES!!! The place was bustling with activity. A number of AT hikers that I hadn’t met yet and Georgia’s finest version of yuppies were milling about everywhere. I browsed for a second, grabbed two cans of Coke (MMMMM…I LLOOVVEE Coke! ), and some frozen pizza (mmm), and called up Goose Creek Cabins to take me in. Their shuttle driver loaded me up with a few other dirty, smelly hikers and our packs. Off we went rolling down the mountainside. The sensation of being in an automobile on hard pavement was already quite new to my senses. Once I was checked in (And even before indulging in the Coke and pizza), I had to get my boots and socks and moleskin off. I slowly, painstakingly removed my socks, and the layer of dry mud with them. Then finally I peeled the duct tape from around my heels and ankles. This was much worse than I thought. I was hoping that my heels had healed a bit. How stupid. They were an open, raw, bloody, oozing mess. And the duct tape, oh, my skin had not taken well to the duct tape. There was a red, bruised stripe where the tape had been, and the edges of the tape had dug into my skin and opened up a few more tiny wounds. I’m undecided on whether to let this heal with Neosporin on my own, or to get a ride to the clinic in town. Either way, it doesn’t look like I’m hiking anywhere tomorrow, or even the day after, considering this and my soon to be shot-out knees. Rats. From Woods Hole Shelter to the top of Blood Mountain was a climb of just less than one thousand feet. From there I descended almost 1,500 feet to the road at Neels Gap. All the pains of this crash course in backpacking fully came to life throughout the descent. My feet were two solid blocks of pure pain. I’d subconsciously known that this was going to be a big problem, but succeeded in mentally shutting out the thought of it thus far, until this day. The tender care with which I finally, gingerly removed my socks (The ones I’d been wearing for four days) is burned into my memory. It’s my clearest recollection of all from this day. My knees had taken an awful beating as well. Upon arriving at the two-story Wolf Creek cabin at Goose Creek for the evening, I realized that simply walking up and down flights of stairs gave me great pain. Not only muscle pain, but bad joint pain. Some time later, in the year after this trip was over, I’d be officially diagnosed with patellar tendonitis in my left knee. Fifteen years later the tendon is seemingly permanently inflamed (But not painful, thank goodness, though it still “gives way” sometimes). I attribute the permanent knee damage to these first four days on the trail in Georgia. Prior to the trip I’d purchased a wooden walking stick at an outfitter store near my home in the Lehigh Valley, Pennsylvania. (For those of you familiar with the area, I think I picked it up at Eastern Mountain Sports in the Lehigh Valley Mall, or maybe at Nestor’s on MacArthur Road). The stick had the image of a wizard’s face engraved near the top of it. I liked it very much. Sadly, I forgot it and left it behind on this day at the Walasi-Yi Center at Neels Gap. It was because of my awkward haste to jump on the shuttle to Goose Creek that I left it behind. It was lost. The stick never turned up anywhere. The shuttle brought myself and a gaggle of other hikers down the hill to the lodge at Goose Creek Cabins. The main building had an impressive collection of stuffed game animals, shot firsthand by the brother (?) of the owner, Keith Bailey, a kind and welcoming gentleman. In the ensuing days here I’d experience my very first and perhaps best example of “Southern Hospitality” in all my life. The rustic cabins surrounding the main lodge and fishing/duck pond were full, so the shuttle driver took me up to “Wolf Creek,” a modern cabin up a hill. I shared the cabin with a young couple from Boston and a woman named Julia. After the obligatory shower, stuffing my face, and tending to my feet, I mostly kept to myself for the evening and passed out.